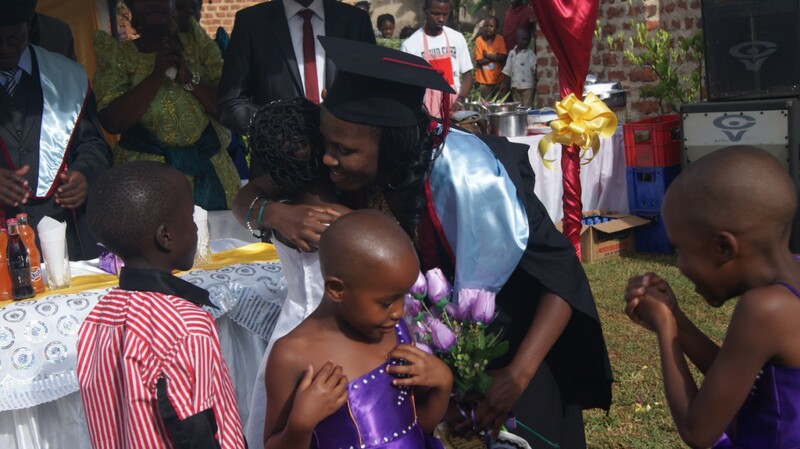 The first in a family of 10 siblings to attain a degree, Lydia graduated with a Bachelor’s degree in Social Work and Social Administration on October 17th, 2014 at Ndejje University in Uganda. “There was immense joy,” she beams, lighting up the room with a nostalgic smile. The whole family stayed awake the eve of the graduation day in excited anticipation of the upcoming ceremony and festivities. Not willing to let anything ruin their great day, especially the notorious city traffic jam, the family arrived at the university at 5:00 a.m. for a ceremony that would start at 8:00 a.m.
Life growing up for Lydia was not a smooth ride. With her mother as a housewife and father a driver in a food company, school fees were not a priority. This did not deter Lydia’s education ambitions. Because she worked hard at school and performed well, her parents were motivated to strive to pay her school fees. 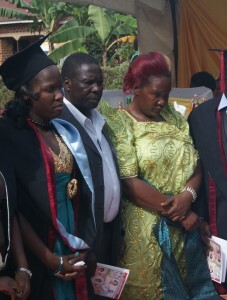 In her Uganda Advanced Certificate Education (UACE) exams, Lydia excelled. But university was a far cry amidst her family’s financial constraints. A year later, she found out about ASSET Uganda. “There was still hope for me,” Lydia smiled as she reminisced. 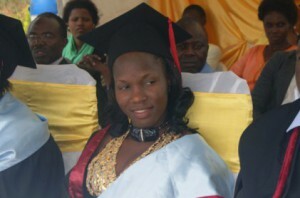 She applied to ASSET Uganda online and a few months later was accepted into the program. “With this news I was excited, God had done it for me!” says Lydia. On the advice of a close friend, she applied to Ndejje University and was thrilled to learn a month later that she had been granted an admission to pursue a degree in Social Work and Social Administration. With her tuition and accommodation catered for, Lydia looked for ways to cater for her basic needs. She borrowed 15,000 Uganda shillings (or about $5) from a friend to start a business making half cakes (locally known as “bundazi”). She sold each for 300 Uganda shillings (or about 10 cents). This was a skill she had picked from her mother when she was in secondary school. Her business grew beyond the university to the friends and families of staff and students, earning her the nickname “bundazi”. Even with business booming, she was careful to balance it with her studies. Lydia woke up at 2am and studied till 4 am, and slept again till 5am when she woke up to start preparing the half cakes for another hour. In her last semester she gave up the business to focus on her studies. As is typical of the majority of university graduates in Uganda, those who are lucky to find employment often take on jobs outside of their chosen field of study. Lydia got a job managing a car washing bay. On one of the slow days at work, an idea crossed her mind to use recycled braided hair extensions to make unique art pieces. – “The outcome was amazing,” she said. It was a beautiful flower. “Excited, I carried it home and showed it to my mother, who loved it”. This motivated her to keep trying out other art pieces out of the recycled braids, an idea that would come in handy in her appreciation to ASSET Uganda in appreciation of the milestone she had achieved. When her results had been released and she saw her name on the graduation list, Lydia made an ASSET Uganda art piece using the recycled braids as a gift of thanks. Six months after her graduation, she continues to manage the car wash, help her mother rear chickens, and is taking orders for art pieces from recycled braids, as she continues to look for job opportunities as a social worker. Thank you for making me what I am today. I am respected at home, have good friends and I have been exposed to various perspectives of life. You have helped me accomplish my dream, and I hope that there’s a lot in store for me. My graduation pictures hanging in the living room at home fill my heart with joy. I hope to pass on the skills and knowledge that I received during the ASSET conferences to my siblings and friends, so they too can become an asset. And I hope to earn enough income to also support my school-age siblings so that they too can achieve their dreams.